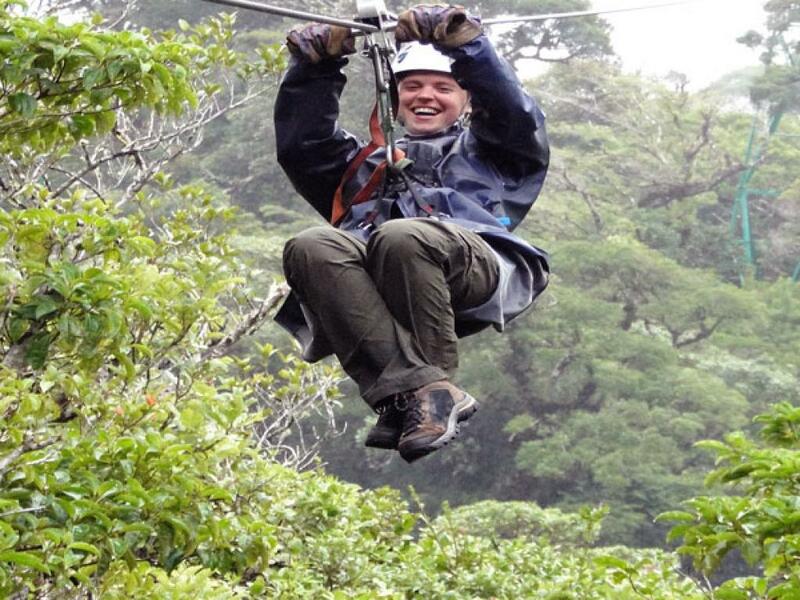 Sky Trek in Monteverde is a fun zipline canopy tour! 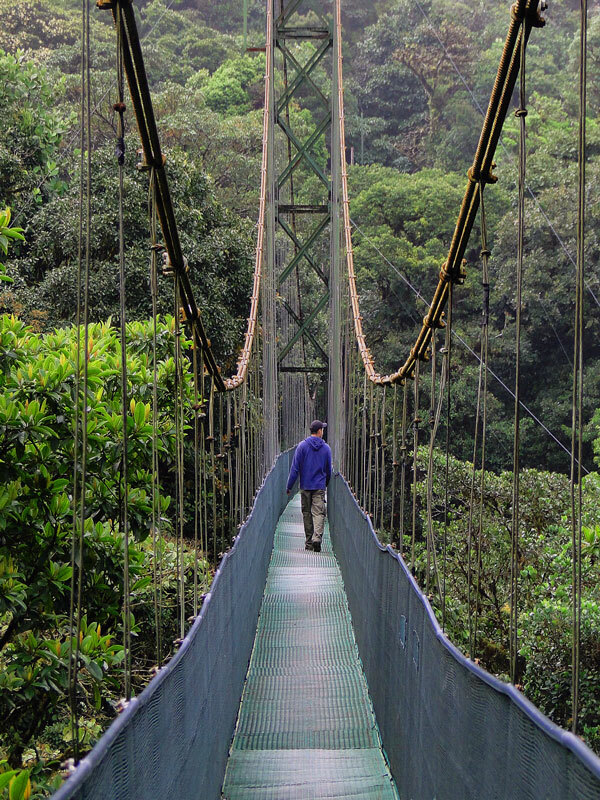 Ride through the air on a system of zipline cables in the cloud forest. There are 9 cables with lengths between 1200 feet and 2310 feet and heights of 60ft to 480ft. The Skytram and Skytrek have to be done as a combined tour (you cannot do just the ziplines, as the tram takes you up and the ziplines down!). Although you can do the tram on its own. 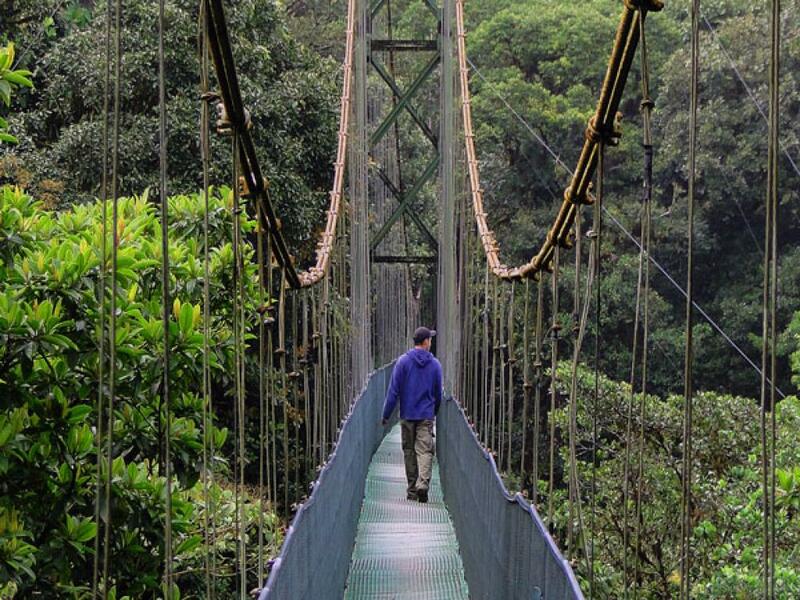 Or combine it with a guided hike on the Skywalk bridges. The tour is suitable for anyone over 8 years old with a sense of adventure. No experience is needed. 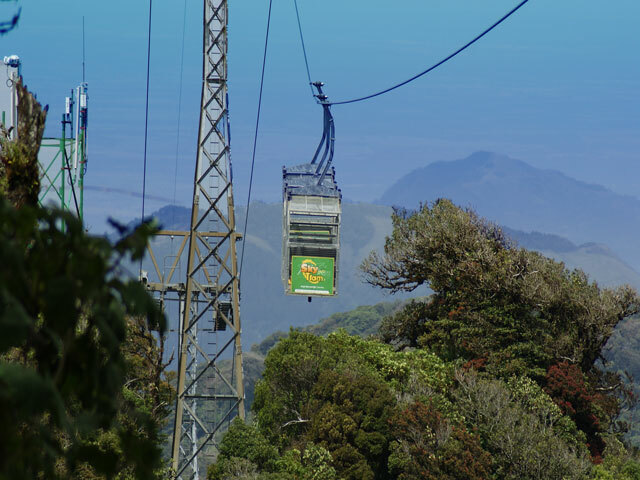 The Sky Tram is a 10 minute cable car ride which not only offers beautiful views and photo opportunities of the cloud forest, but on clear days you can see Arenal Volcano. 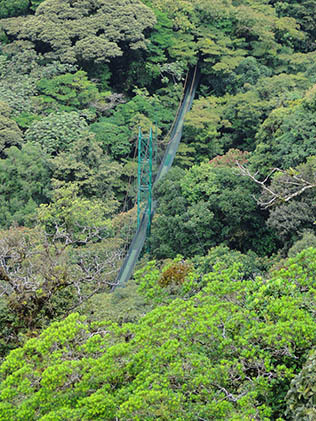 The Skytram will take you up the mountain to the base of a tower that marks the first zipline run. 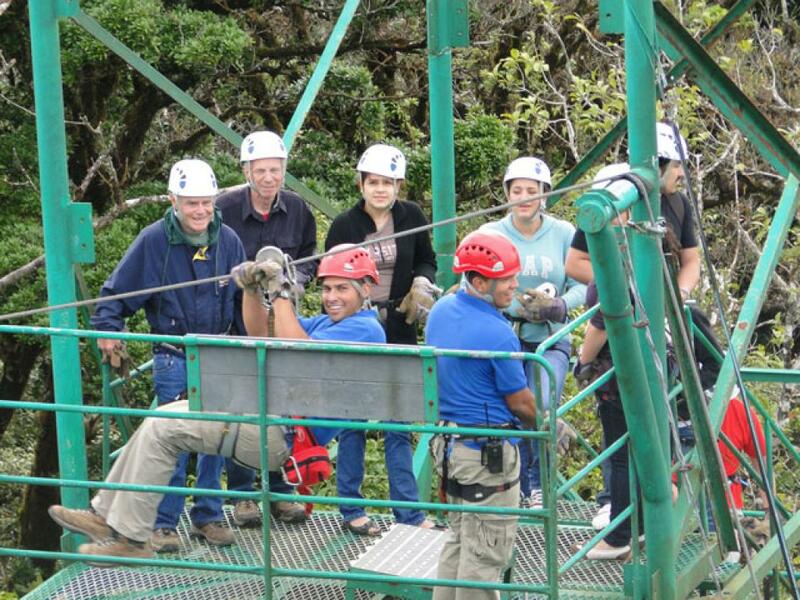 The first four ziplines begin at the top of the mountain, above the tree line. 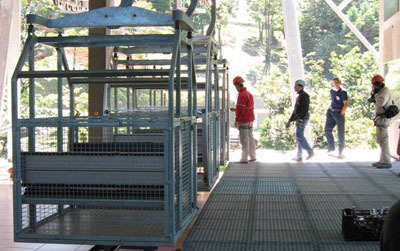 With the construction of the cable car system, the need to walk between zipline platforms has been practically cut out. Currently, most ziplines run from platform to platform and a few ziplines will deposit you at the base of a tower, leading to a very short climb to the next platform. 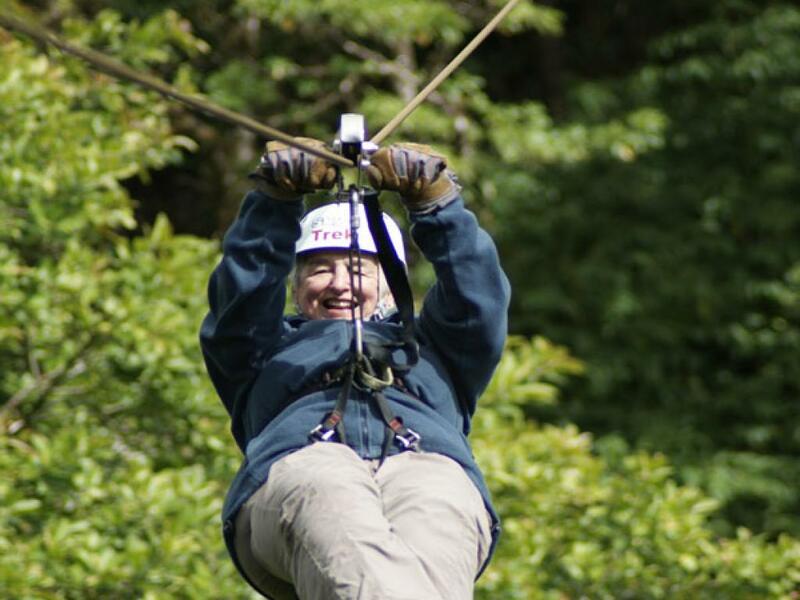 Once at the top, the exhilarating adventure of ziplining down the mountainside begins, ultimately returning you to the starting point at the main building. New Vertigo Drop! Drop down from a platform like Tarzan! For Sky Trek the minimum height is 1.20 mts. There is a weight restriction of 275 pounds (125 kilos) with a maximum waist of 47.5 inches (120 cm) and maximum thigh of 31.5 inches ( 80 cm). Note the Skytek and Skytram are complementary: you cannot do just the Skytrek (ziplines). 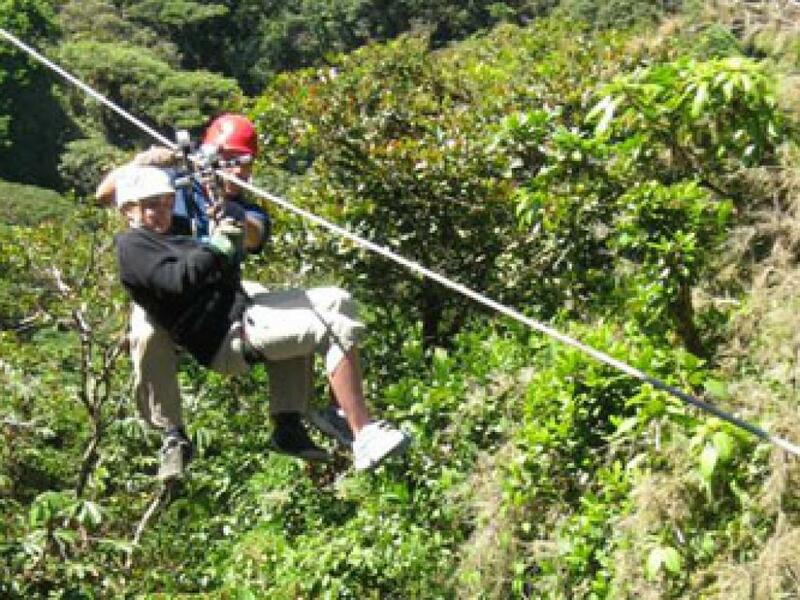 Together, the ziplines and the Skytram complete distance stretches of almost 3kms and the tour takes approximately 2.5 hours (plus transport time). 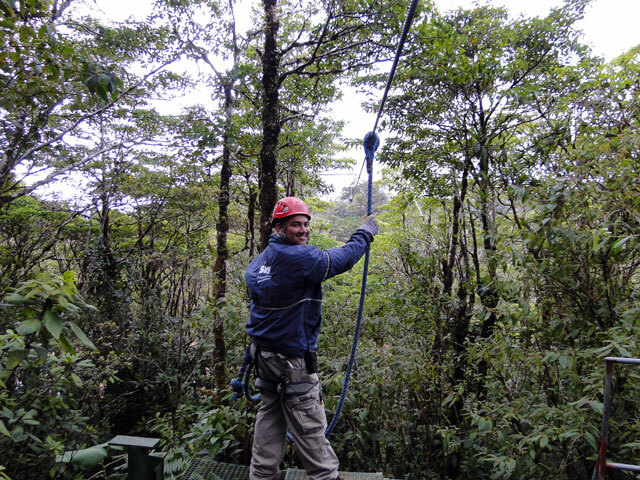 Before leaving the main building to start your tour, you will be fitted with all of the necessary safety equipment (harness, helmet, gloves); which the guides will take care to properly adjust. Afterwards the guides will deliver a safety speech detailing proper form and the braking system. There are two observation towers above the treetops from which you can enjoy a panoramic view of the San Carlos, Puntarenas, Guanacaste areas and the golf of Nicoya. 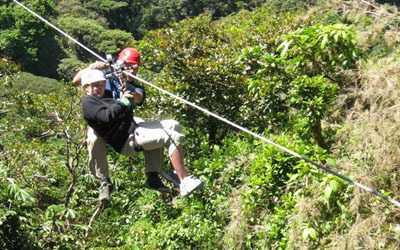 Due to the extreme length of some of the ziplines and the prevailing wind speed, the guides may have you ride tandem. This style utilizes the added weight of a second person to ensure that you reach the next platform. 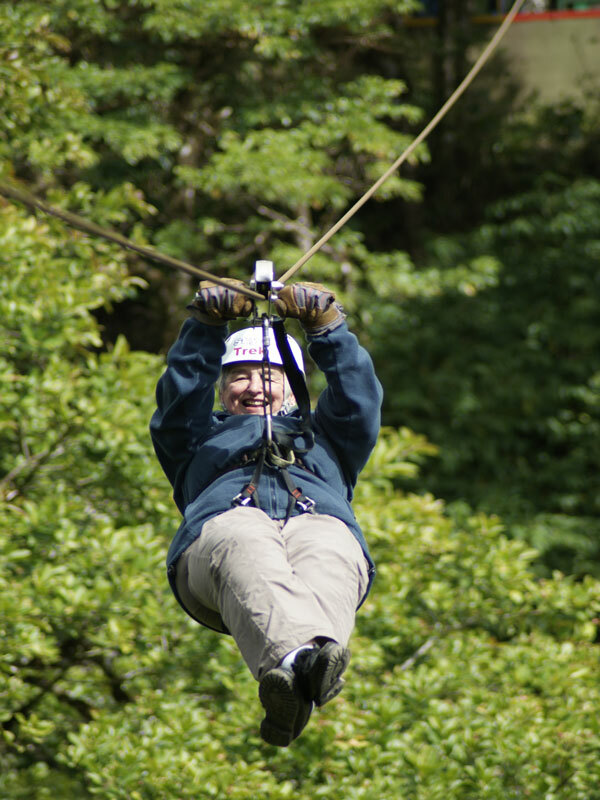 In the event of lightening or winds exceeding 120 km/h (75mph) Sky Trek will cancel its tours for safety reasons; with lesser wind or rain only serving to add to the excitement, and speed, of the zipline tour. 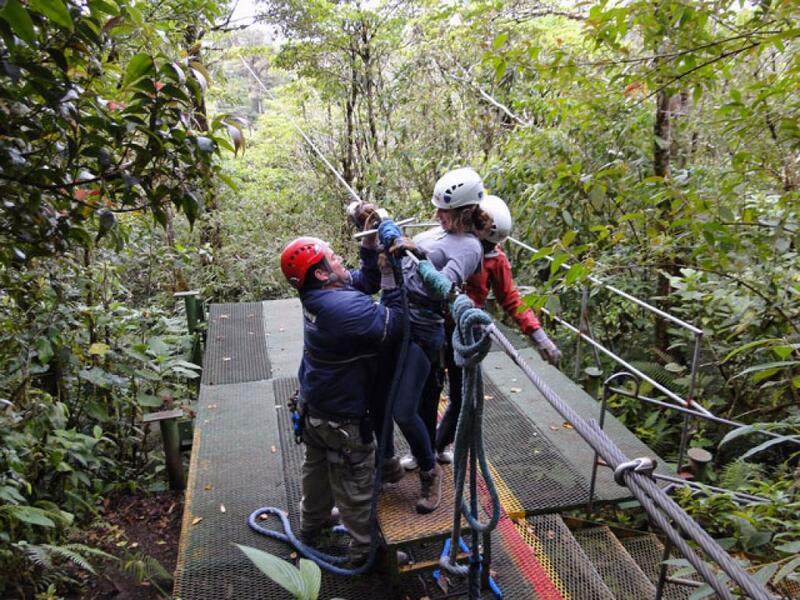 Sky Trek also provides complimentary lockers to store your backpacks while taking part in the canopy tour. Ever wanted to learn how to climb a tree? 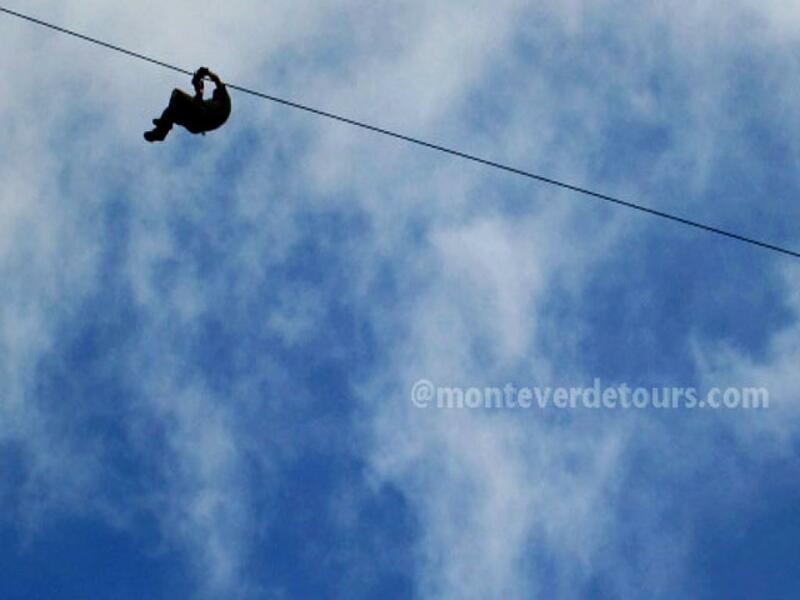 Try the new activity at Monteverde Skytrek! The Arboreal tour will put your strength and sourage to the test. There is a total of 7 trees each one between 12 and 17 meters high. Each one will give you a different experience as they have varying heights and climbing challenges. Safety is a priority and all climbers are given safety talks and equipped with a belay system, just like rock-climbing but up a tree! The trees have handholds specifically designed for this activity and cause no damage to the trees. 7.30am, 9.30am, 10.30am, 12.30pm, 1.30pm and 3.00pm. 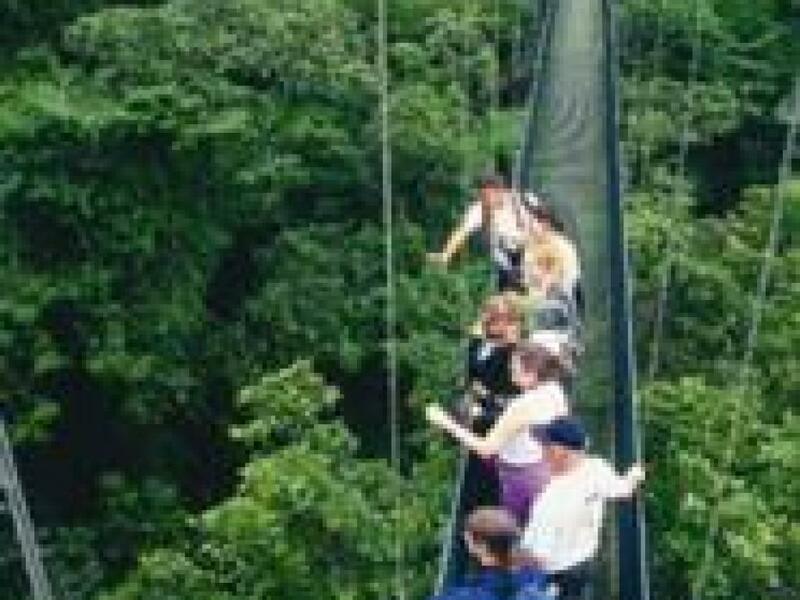 For wildlife viewing the Skywalk (hanging bridges or suspended bridges), offers the best opportunities as often the ziplines are too fast and high for suitable wildlife viewing. 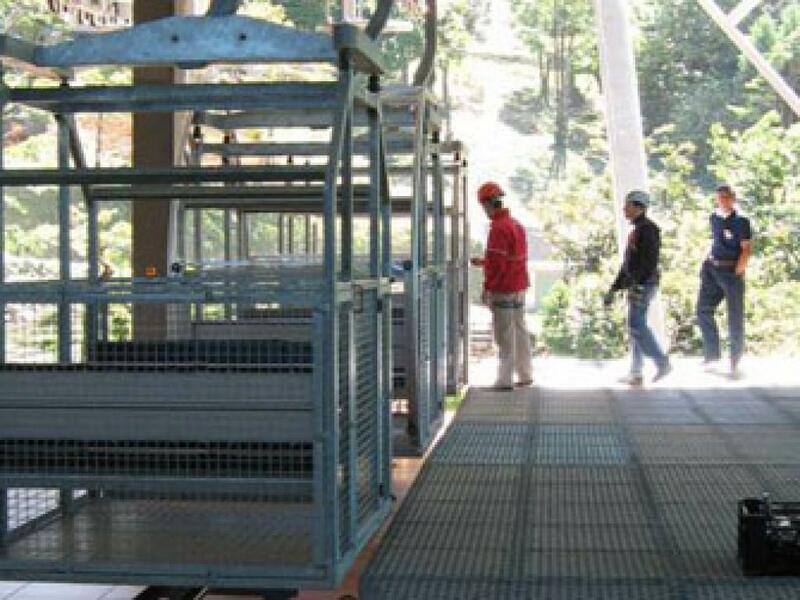 You can do the Skywalk without the tram or ziplines and it is you choice if you want the guide (same price) but if you do want the guide there are usually two times a day available at 8.00am and 1.30pm (and sometimes at 10.30am). The guided tour is about 2 hours and you do 5 bridges. For an exciting and adrenaline filled Canopy tour, above and through the Monteverde cloud forest, try Sky Trek.... simply great Costa Rica Zipling here in Monteverde Costa Rica! 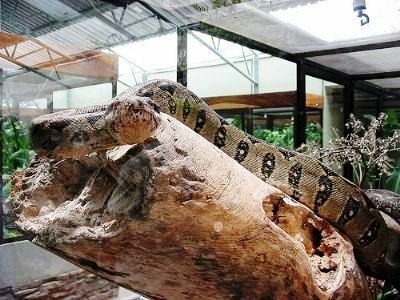 The Serpentarium is run by the same owners of Skytrek and Skywalk and is located 300m from Santa Elena center (about 10 minute drive from Skytrek and Skywalk activities). Within its modern and spacious exhibition space, a natural environment has been created so that you can have a safe and wonderful opportunity to learn about the fauna of Costa Rica. Here you can view over 40 species of both poisonous and non-poisonous snakes, reptiles, frogs, lizards, iguanas, other amphibians, and some turtles. Guided one hour tours are available. The Serpentarium is open 8.30am-8.00pm everyday.